Z’thandra is a Swamp Elf, perhaps the last of her race. A foundling raised by a pair of Reptars (think humanoids with scales and tails), she spends her days helping out and trying to avoid the Reptar’s natural daughter, who hates Z’thandra just because she exists. In fact it would seem that all Reptars save the elf’s foster parents have a great dislike for her. Is this racism left over from the Human/Reptar/Elf war? Could be. Because of that war the Reptars have lost the ability to maintain their former technological supremacy. They can’t make new things, are unable to repair the old, and have been reduced to daily scavenging for workable items left over from the war. I can’t see such a dying race, in general, not turning some of their fear and anger on a former enemy. The war seems to have had its basis in magic, and the only human in the story turns out to be a sorcerer. Even Z’thandra has a paranormal talent: she can see into the future. But like her heat vision, Z’thandra rarely uses her talents; they both cause incapacitating headaches. So, we have a war ravaged planet where magic and technology once co-existed. There are three broken races doing what they can to hang on. And then there’s the stone (We can’t forget the stone.). What is it? Where does its power come from? Who brought it to the Reptars? Why is there a Human after it? How is it that Z’thandra can communicate with it? Read the story, I say. Shades of Green is a novella that feels like a short story. You begin reading, then suddenly there are just a few pages left. I remember thinking “How can she wrap all this up in a few pages? This should be a novel!” Then author Rhonda Parrish performs her own magic, standing the story on its nose and stepping off onto an unseen trail. 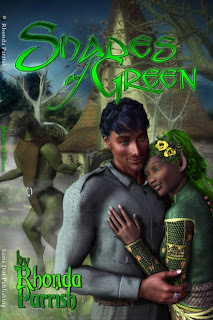 The ending of Shades of Green is one of the best literary surprises I’ve had in a long, long time. 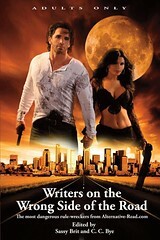 Parrish gets a walk on any criticisms regarding her skill in the craft of writing. When a story pulls a reader in to the extent that he forgets about all else, the author has done exactly what she’s supposed to do. Secondly, a twisted ending the reader won’t see coming is a wonderful gift. Join our Yahoo Chat & Promo group! Direct links to giveaways* below! **If you are entering a competition but going on holiday please let us know!